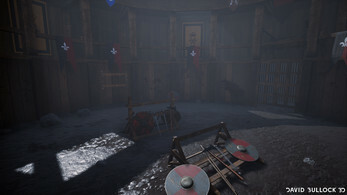 A fight arena environment I created for Aardvark Swifts Search For A Star. 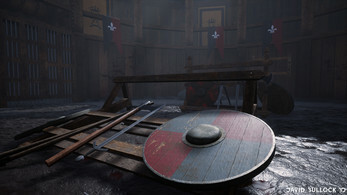 I have always been interested by the Medieval period, and its influence in games such as Oblivion, The Witcher Series and Kingdom Come Deliverance, as well as TV shows such as Vikings and Game of Thrones. For this project I knew I had to keep the scale small, so modularity was key to keeping within the time constraints. Through this project I wanted to improve my approach to realism by producing detailed assets, and textures. I decided to produce a fighting area, as not only was it very modular but allowed me to develop my skills in storytelling. I wanted to develop a ‘brand’ of an important household within a kingdom allowing me to explore making my own crests. Overall the project went well and I’m happy with the outcome of the environment, but i feel could have been better. I’m not happy with the fabric I made, i feel it looks to stiff, if i was to do it again I would investigate software such as Marvelous Designer to help me create more loose looking cloth. In addition i feel the scene looks bare in the upper areas as I was struggling to think of props, if I had more time I would do some more research into the period and hopefully find ideas for props to create. However i really enjoyed the process and my investigation into the Medival era, and hope i can further develop this scene with more additional set dressing in the future.